While sequentially it would be the next logical address after #22, there was no 23 Berkeley Square; inexplicably, the house on Lot 14 was to become #25. But there was a #24, built by Francis Eugene Bacon in 1911 on Lot 16 at the subdivision's southwesternmost corner. Bacon had bought lots 16 and 17 from William R. Burke in late 1909 for a total of $22,500, first building his own house on Lot 16 and, two years later, what became #22 on Lot 17, which he then sold. The two starkly similar houses were designed by prolific Los Angeles architect Frank M. Tyler and were the only example on the Square of the practice of building similar adjacent houses, which was more common in less expensive developments. While the entrance canopies differ, the arrangement of the bays of the front elevations and of the porches flanking the entrances are the same. The only differences in lower-floor building materials that Times real estate writers describe are granite for #22 and sandstone for #24, which in their estimation rendered #22 to be of Italian Renaissance design and #24 to be Spanish Mission. At any rate, it seems odd that an architect as well regarded as Frank Tyler would have been happy with such "badge engineering" (as later automobile-industry practices would turn a Ford into a Mercury, say); was Bacon able to talk Tyler into giving him something of a twofer? The Department of Buildings issued permits for #24—originally #16 for its lot number before citywide annexation-related renumberings during 1912—on December 10, 1910. While Los Angeles was famously built in large measure by Midwesterners and Berkeley Square followed suit, Francis Bacon was more of an Easterner, born in Fulton, New York, north of Syracuse, in 1851. Though from a long line of physicians, young Bacon seems to have had a fascination with the dry goods business. His passion for millinery and haberdashery led to his building very successful stores in both Fulton and Syracuse, though after 40 years in the business he was ready to ditch the thread game and rest on his laurels in a sunnier clime. 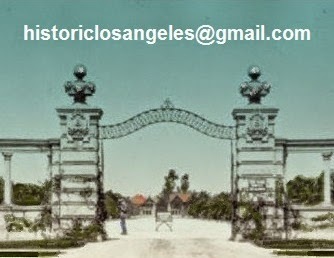 He and his second wife, née Cora May Hiscox, had been wintering in Los Angeles for several years, so when the neuralgia and the rheumatiz began to kick in, they decided to stay and make the snowless City of Angels their full-time home. In those days, the charms of Los Angeles were such that people actually chose the city as a place to spend their retirement, much in the way they might have later chosen Santa Barbara or Palm Springs. Perhaps to celebrate a lifetime of hard work, the Bacons went all-out in hiring Frank Tyler, who lived nearby at 1817 South Harvard. The architect came up with a vernacular design giving no indication of its intended occupants' origins. The first floor of the Spanish Mission-inspired house—or, as one source calls it, Spanish architecture combined with Mission (perhaps only Frank Tyler ever knew)—was constructed of Chatsworth Park sandstone, a grand name for rock brought over the hills from the Valley. 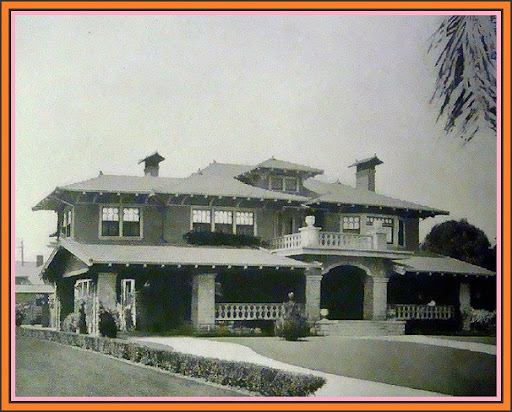 Inside, there was a note of the Arts & Crafts movement in the lavish use of quartersawn oak, with a few exotic design elements other than the Spanish, including the Square's seemingly obligatory Japanese tea room for the ladies to complement the expected billiard room for the boys. I know that as a noun the word mangle refers to something like the wringer on an old Maytag—I can find no other definition for the word as a noun--so the description of a "fine ruby tile mangle" in the living room is intriguing. But one begins to appreciate Elsie de Wolfe's innovative sweeping away of the bric-a-brac back East when the overall picture of rooms of scratchy-looking tapestries and heavy mustard-colored velvet curtains on iron spears is described as being in "good taste." Even after the demise of the King, local interior desecrators seem not to have figured out that Edwardiana wasn't far enough removed from its predecessor to open interiors to California's great advantage: the light of the great outdoors. 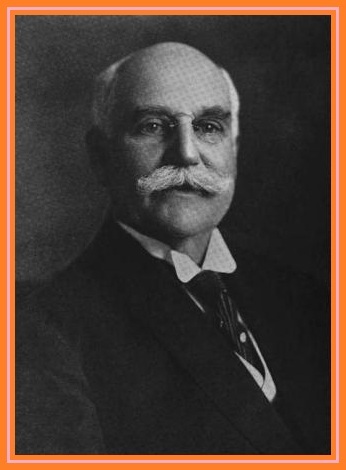 Francis's Bacon, Chappell and Company emporium back in Syracuse continued to prosper in the first decade of the new century, and it wasn't until after his move to Los Angeles that he sold the business on a high note. After years of being a very active civic booster of Syracuse, once permanently settled out west, Francis "sought no outlet for his business energies," as one profile put it. He and May led the quiet life of California retirees in grand bourgeois style on the Square, though they were social enough to have been included in the Southwest Blue Book. Francis occasionally wandered downtown to the exclusive Los Angeles Athletic Club or attended to his memberships in various ancestor-worship organizations, the Sons of This War or That Revolution. It's not clear who joined him in his billiard room to rack 'em up—it could be that one of his three sons (of five children) by his first wife, Gertrude, would visit from back East from time to time. Twenty-three years her husband's junior, May Bacon was perhaps more active, making use of her tea room for, well, tea, and, sometimes, cards. She and Francis had married in 1902, a year after Gertrude died. They did not have any children of their own. One oddity in the history of #24 is the listing of prominent Progressive-era reformer (and later Superior Court judge) Russ Avery and his first wife, also named May, in the 1923 Southwest Blue Book alongside the Bacons. I can find no family relationship between the two couples; perhaps it was a rental or perhaps the shelter was a friendly gesture, the Averys being between their South Oxford and North Rossmore homes that year. The Bacon house was, over its life on the Square, rather staid. Francis died at home on February 28, 1931; May stayed on at #24 for another nine years, until her death on July 25, 1940. After nearly 30 years, perhaps (one hopes) with its interior lightened up, the house was ready for a new family. Enter that of electrician Frank A. Russell and his wife, Ida, about which little is known. Frank Russell was on voter rolls at #24 intermittently through 1954; John N. McMahon Jr., possibly a Russell relative, is at #24 from 1952 through 1962. Vernon N. and Martha A. Battle claimed it as their voting address in 1956. Oddly, #24 does not appear in available Los Angeles city directories from 1956 through 1962, but it does reappear in 1963, listing Howard Petty in residence. Then, along with its neighbors and the grand Rosenheim gates hard by its front door, oblivion.